2.5" front and 2" rear level kit? TM can be turned off unless you have 2017. My 5.3 e85 BB tune kills 6.2 on 91 oct stock tune 0-60 and yes i can provide video. Nice truck. Even better looking house. I dont know why but I always look at peoples house before the truck. Wrong forum i guess. Nice truck. Even better looking house. I dont know why but I always look at peoples house before the truck. Wrong forum i guess. Best bang for a buck is was the tune for me. But i never had to take the truck to the dealer either. yes they have 87 89 91-e85 tune with sport tcm or non sport tcm. you can switch with your autocal in about 3 minutes. Love it! Yes he will send you whatever type of tune you need. And on top of that he will retune it for free. As long as it is same vin. 6.2 with afe intake = 36hp! There were 2 mods that truly made a difference in performance. E85 AND TUNE!! It does feel like v8 now. Huge improvement. Other mods did not do much for my 5.3. Just had my bb tune twice. He will give up new tunes to fit your need. Autocal is the way to go so yiu can switch. Fuel mpg tune aggressive e85 tune 87 tune tow tune. I can store all of it in my autocal. Great device. I run sport tcm and e85 ecm 99 percent of the time. Best thing about it is throttle response. Huve smile. I use to think this way but after getting a tune on this truck, I believe gm will leave that much power on the table and then some. Gm de-tuned these trucks this much why would they not restrict air flow? Ok update. Just recieved the tune. Installing tune is a lot easier than logging data or setting autocal for the first time. Pretty straight forward. Justin gave me step by step instruction. Initial impression on e85. I cannot comment on anything else for now. I will have to watch that throttle taking off, cannot drive like i use to unless you want to get pulled over every stop light. Throttle response is night and day. Peak hp wise i cannot tell you. But low end tq is where this shines. 1500-3000 rpm is where this gets going. Mpg suffers big time due to my right foot now. Turned dod off to 65mph. Now i know why there are so many fanboys on here. I am one of them now. Best 550 bucks i spent on the truck. Also i was able to install stock + bb tune on autocal so do not need the laptop. I have no idea why gm will de tuned the truck like this. Will not ever buy a gm truck again. This is just straight wrong far as what they are doing to these ecm tcm. Again thanks blackbear team and thanks for supporting our troops. Go USA! Not expecting huge HP or TQ increase, just want this thing to drive better... By far the worst transmission (first truck though) I have ever driven. oh and that throttle response.... Patiently waiting for the tune now. After all these years no more Chevy for me. Thanks for the info. Also researched since post. Seems like up to personal choice between the two. Drivetrain and engine spec looks the same. 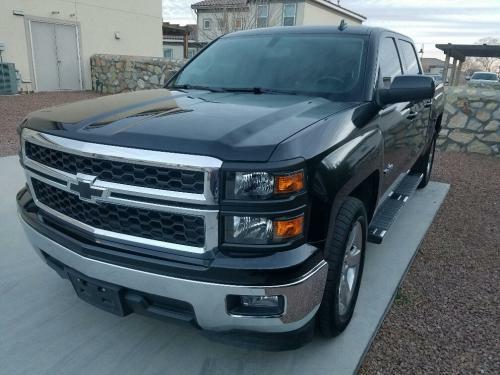 Gmc more for the older folks luxury look and Silverado for tough young look. I am pretty old but went with Chevy. Not impressed by the truck but by no mean regretting the purchase.